LOS ANGELES, March 13, 2013 /Christian Newswire/ — The annual Global Leadership Summit (2013) convened Monday night in Los Angeles with some of the worlds’ prominent Pentecostal leaders under the invitation of Rev. David Andrade. They came from North, Central and South America, the Middle and Far East, Africa and India and represented all races. The vast list of names included David Andrade, Verna Linzey, Steve Dittmar, Gershom Sikaala, Keith Brandt, Jenni Lia, Eli Elibadi, Samuel Padilla, and many others. The unexpected guest speaker at the Global Leadership Summit on Tuesday night was Verna Linzey who had just returned from a crusade in Trenton, New Jersey where revival fires broke out upon clergy and laity alike from New York and New Jersey. When Verna Linzey walked in the auditorium, as she was escorted, all eyes focused upon Verna as a hush filled the air. Even the speaker gave respect and acknowledged Verna’s arrival. At the earliest moment possible, Dr. David Andrade prepared the audience for a special treat and invited Verna Linzey forward to speak on Spirit baptism. Afterward, Dr. Andrade invited Verna to conduct an impartation service in which many people came forward for the laying on of Verna’s hands. 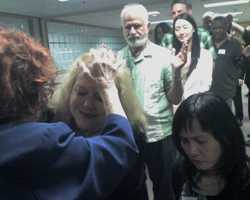 She was used by the Holy Spirit to bring about revival at Azusa Street and Bonnie Brae Street in December 2012 in fulfilment of a prophecy a French prophet gave Fred Berry. Verna was directly influenced by PC Nelson, and Ernest Williams who was at the Azusa Street Revival in 1906. As Verna laid hands on all who came forward in the middle of the Global Leadership Summit 2013 revival continued under her ministry and it has not stopped. The revival has spread since November from a mission in Torrance, spreading throughout California, including Azusa Street and Bonnie Brae Street, New Jersey, and many places around the world to which people took the anointing. Results include church growth, ethnic unity, feeding the poor, salvations, baptisms in the Spirit as confirmed by speaking in tongues, prophecies, other gifts of the Spirit, slayings in the Spirit which Verna does not encourage, tears, crying out to God, quaking under the power of the Holy Spirit, and much more.